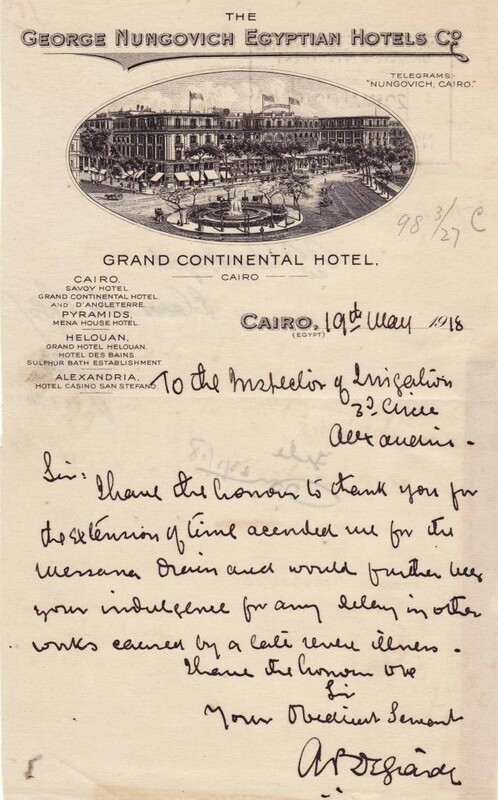 During World War I the British military command saw Egypt, its industries, businesses and people as resources to be drawn upon to assist the war effort. 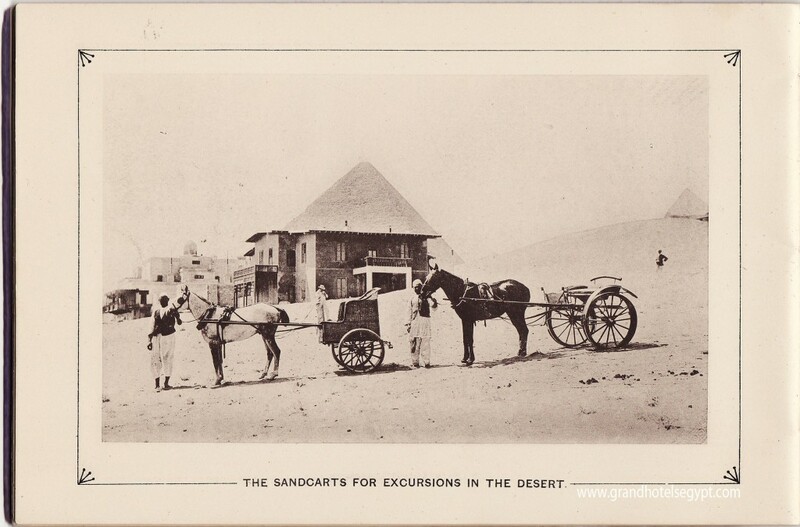 The tourist industry was not exempt. 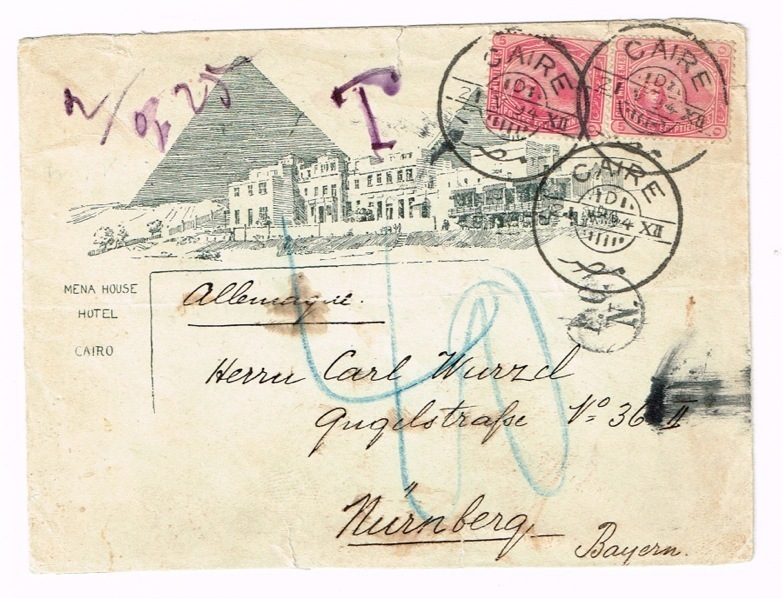 Hotels around the country were requisitioned, as military headquarters in the case of the Cairo Savoy (which I’ve written about previously, here), but more commonly for use as hospitals (San Stefano in Alexandria, the Mena House and Heliopolis Palace in Cairo, Al-Hayat in Helouan) or as places where injured troops could be sent to convalesce (the Winter Palace in Luxor). 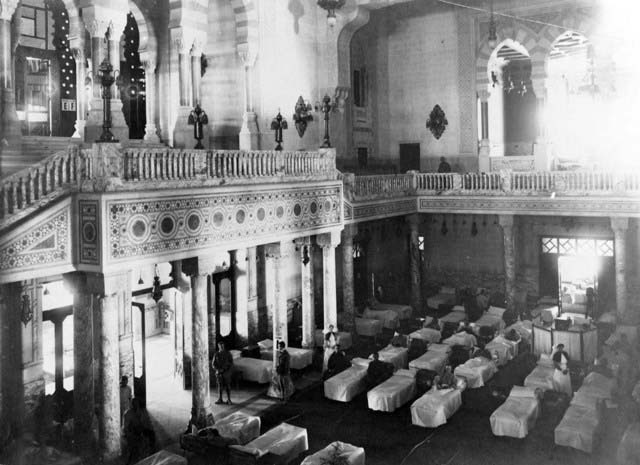 Opened to guests a month over four years previously, in January 1915 the 500-room Heliopolis Palace became Cairo’s main military hospital. 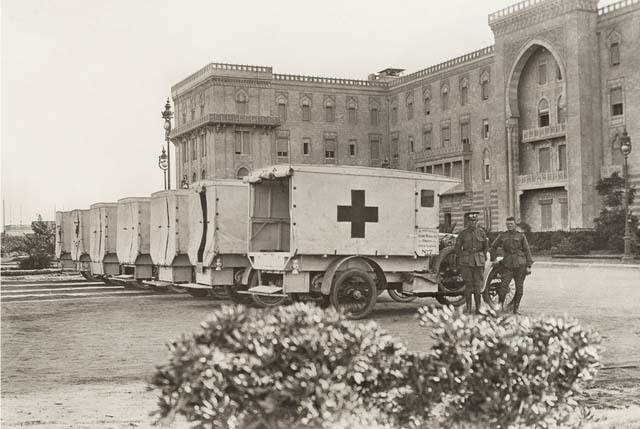 Renamed the 1st Army General Hospital (1st AGH), it was operated by the Australian Army Medical Corps. 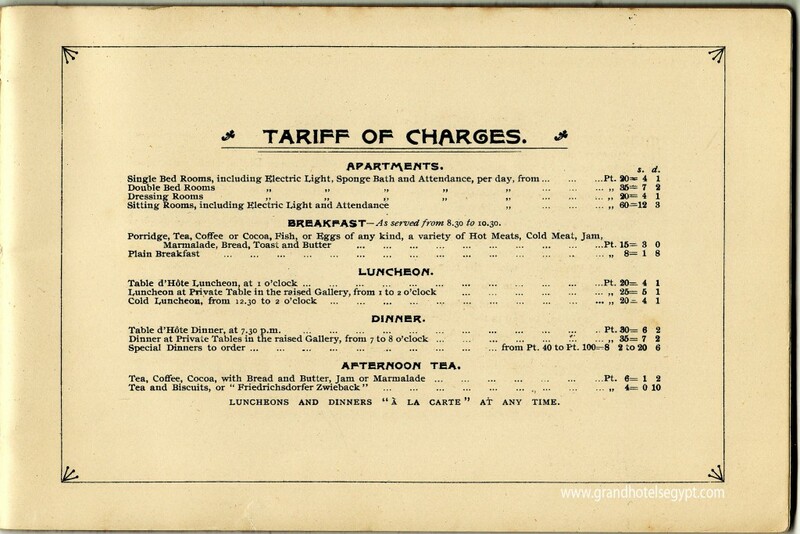 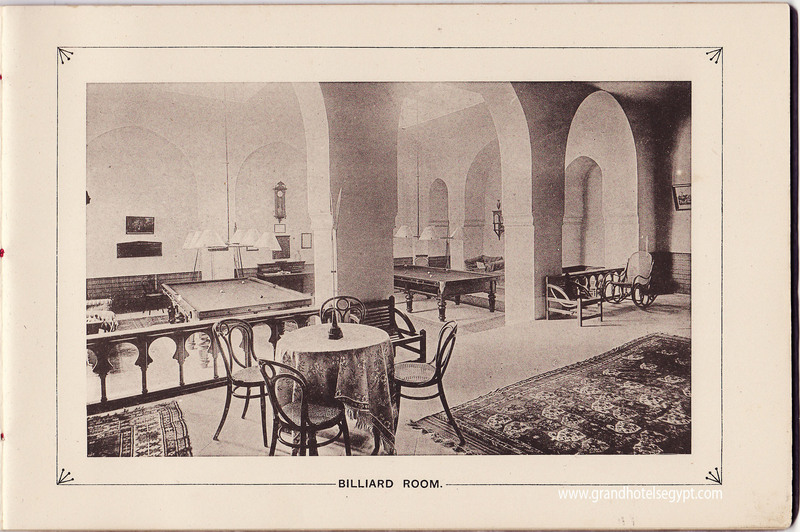 It was reorgainsed to provide accommodation for 1,000 sick, every door on every corridor opening to rooms of neat white beds and the grand dining-hall converted into a great convalescent ward with room for one hundred. 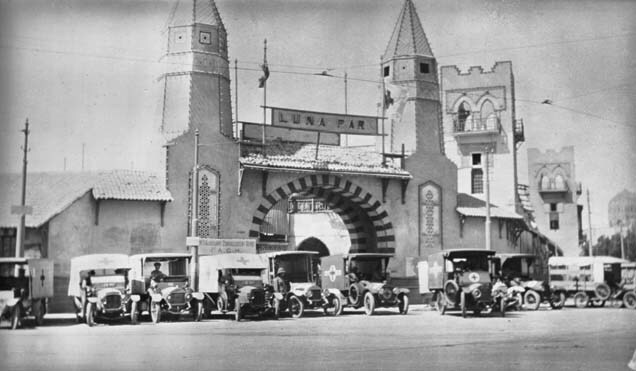 Even so, within a very short time the hospital had to expand into additional premises, including buildings at the aerodrome, Luna Park and Heliopolis Sporting Club. 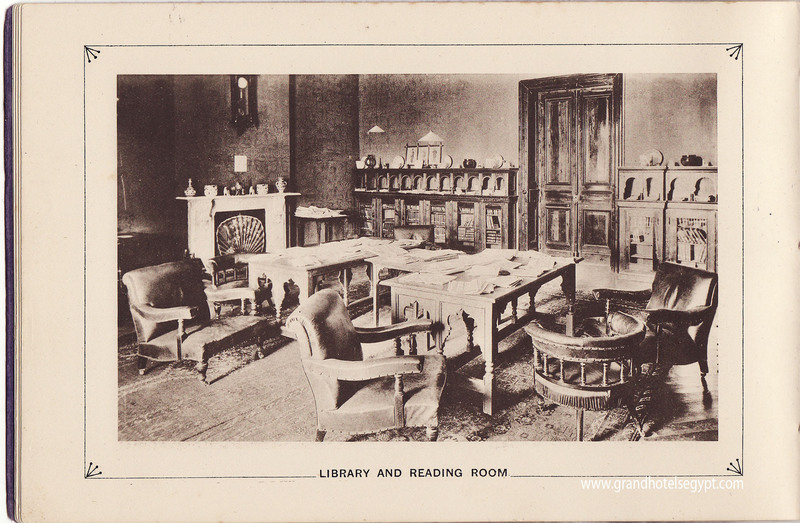 Why was so much room required? 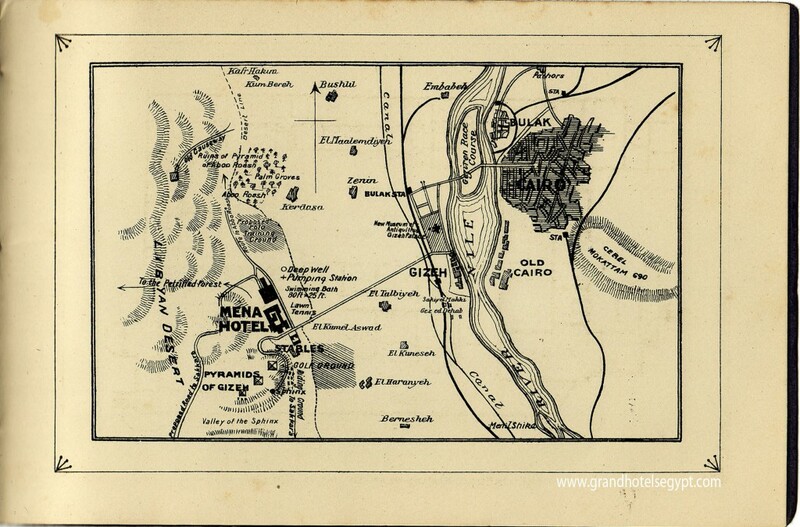 Because Egypt was receiving the wounded from ongoing campaign in the Dardanelles, including the landings at Gallipoli. 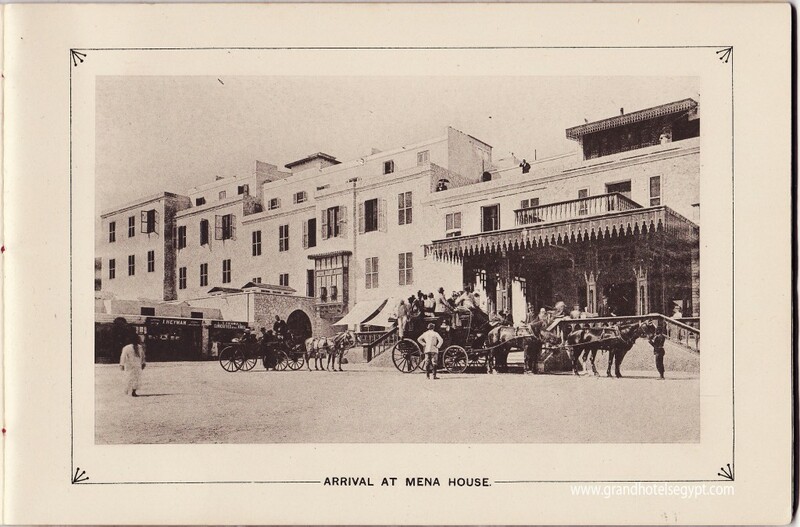 Hospital ships transported the injured and dying the five or six days it took to get to Alexandria, from where patients were forwarded to local hospitals or on to Cairo. 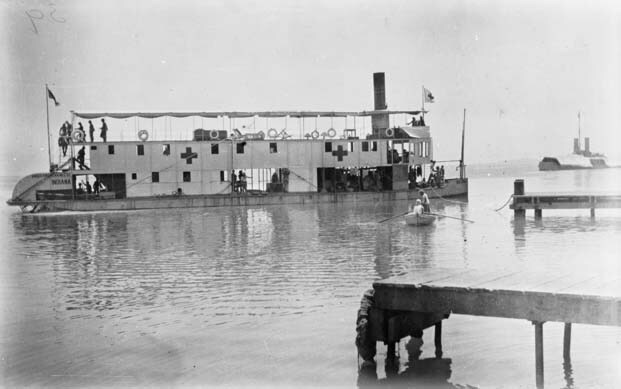 The Indiana, which belonged to the Anglo-American Nile Company, was requisitioned to ferry wounded soldiers on the Suez Canal. 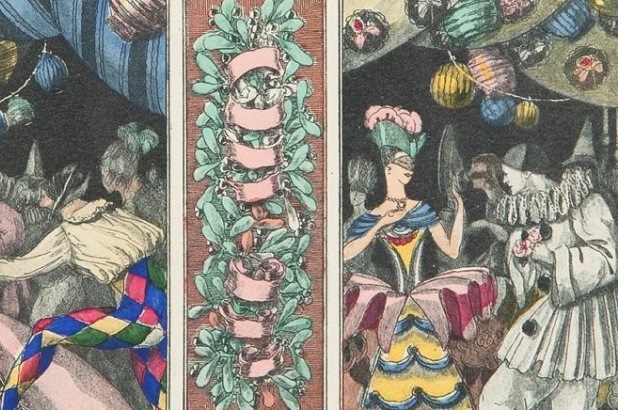 Not everyone was so downbeat. 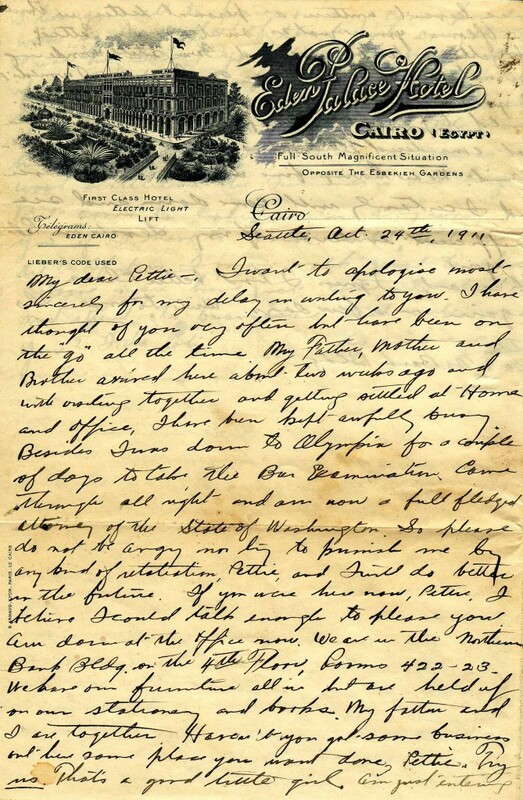 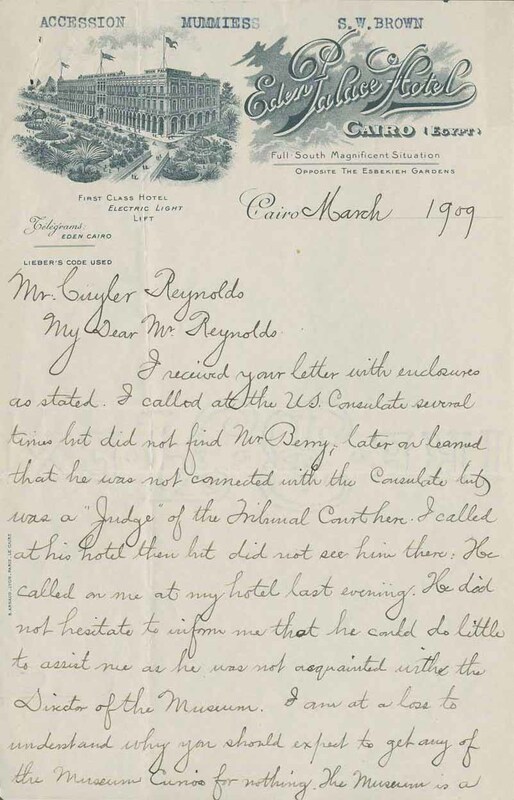 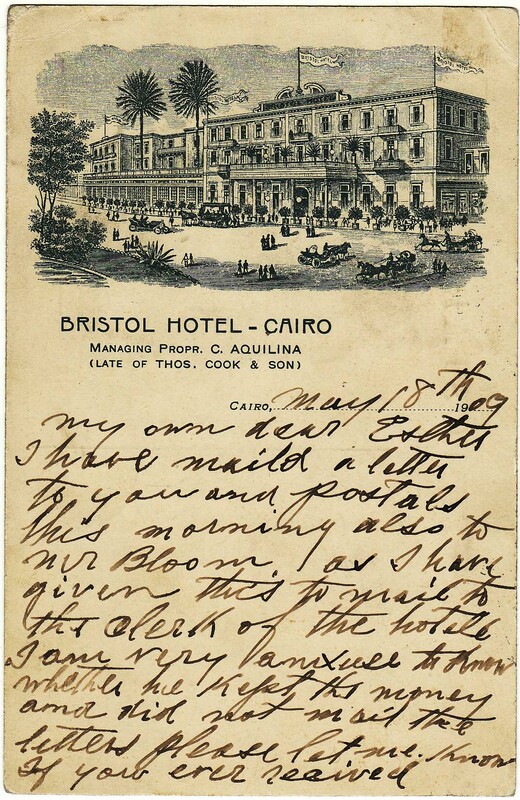 In April 1915, The Queenslander newspaper published a letter from a corporal in the Army Medical Crops who was billeted at the Heliopolis Palace. 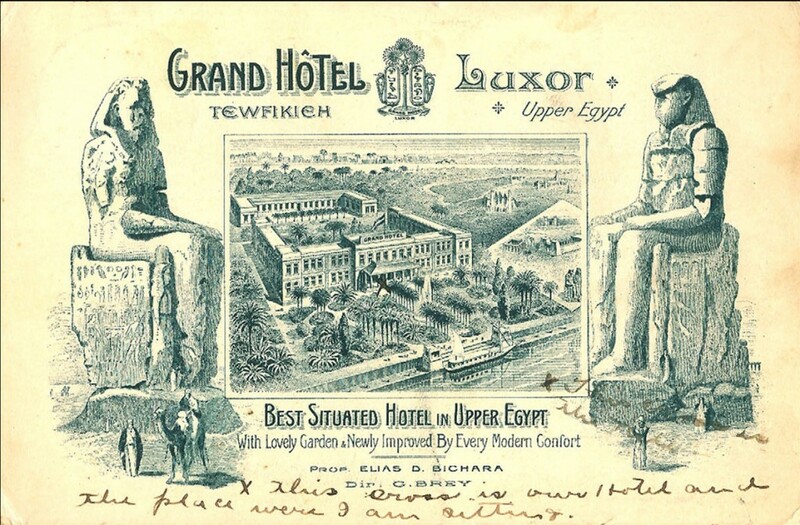 It is said to be the most beautiful hotel in Egypt. 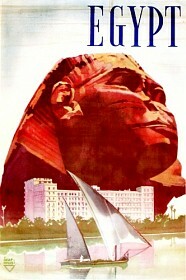 We have been told that it cost £2,500,000 to build. 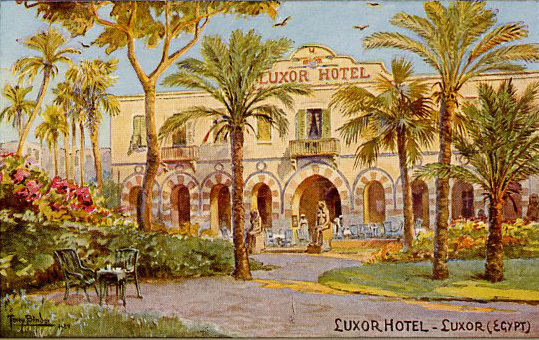 The King of the Belgians, with an English and a Belgian syndicate, built the hotel about three years ago. 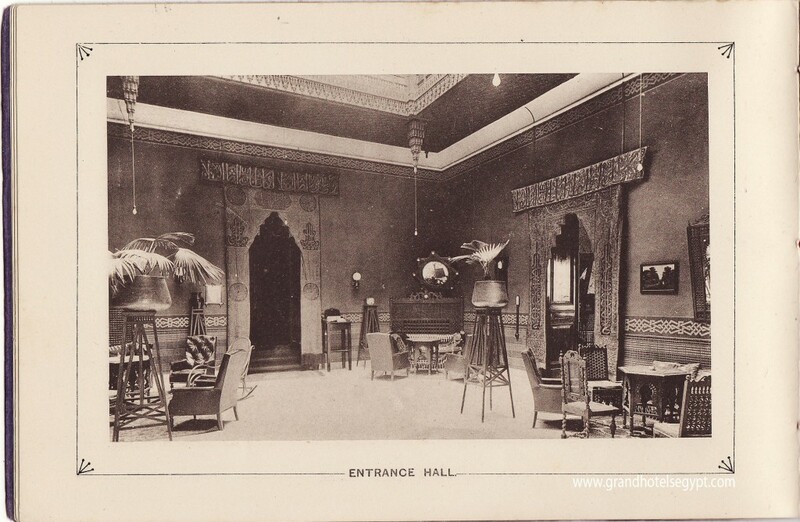 It was to be run as a casino, and the idea was to rival Monte Carlo. 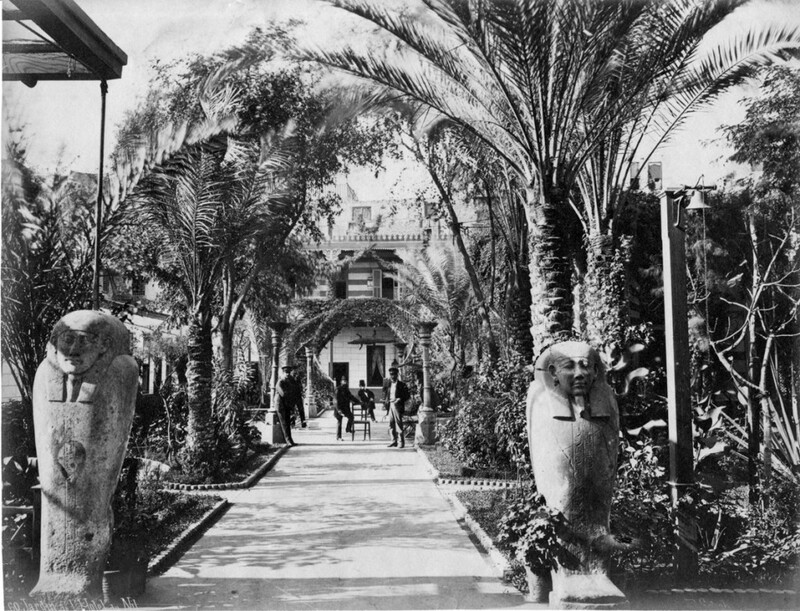 The syndicate was unable to get a license for the casino, and the hotel has been a white elephant. 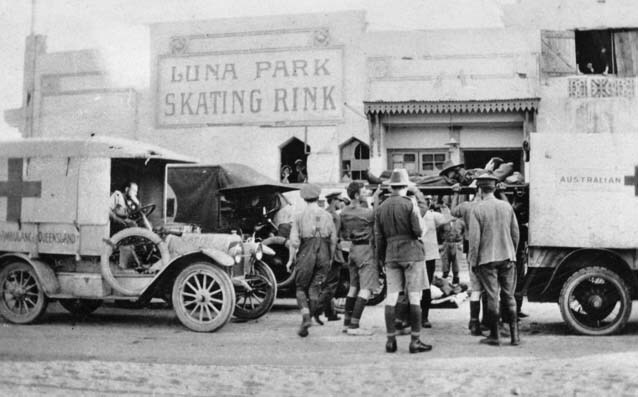 The war interfered with the tourist season this year—it should be in full swing now—and the very costly carpets and furniture have been carefully stowed away. It is possible that the King’s room, which cost £1000 to furnish, with a bed, a chest of drawers, and a washstand, will be made into an operating theatre, and there is talk of providing 800 beds for the hospital, which will be one of the very best. 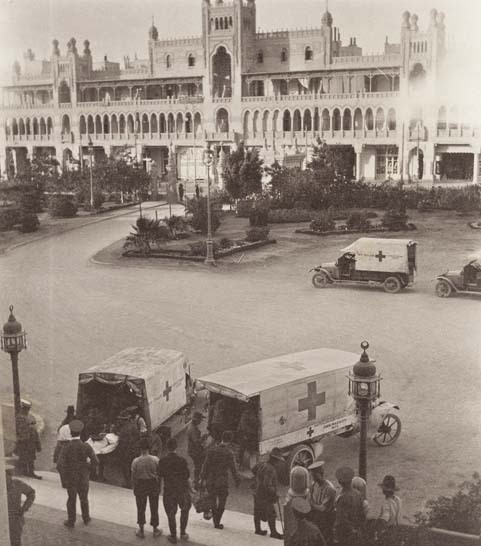 The rear of the Heliopolis Palace with ambulances lined up on Al-Ahram Street alongside. 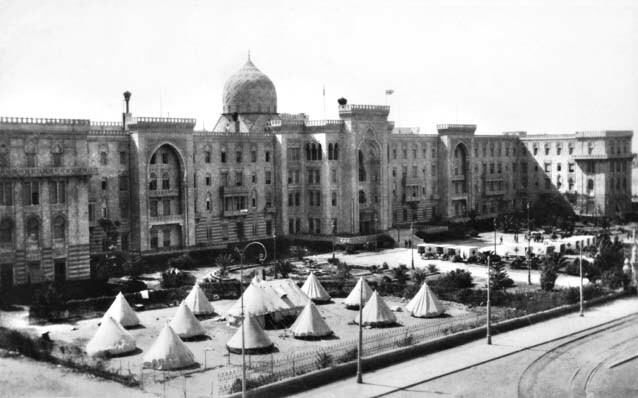 Tents at the rear of the hotel/hospital catering to the overflow of patients. 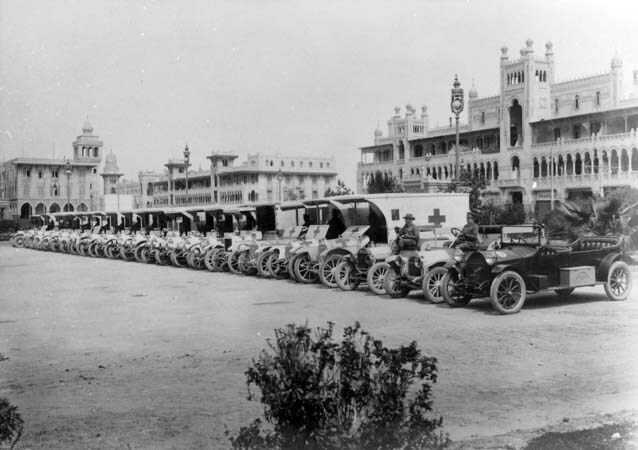 Ambulances parked at the rear of the hotel/hospital. 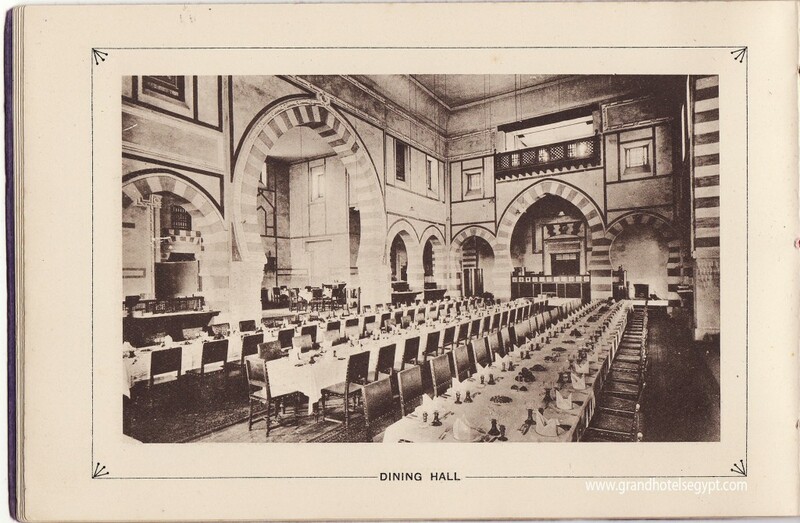 The grand dining hall turned into a grand hospital ward. 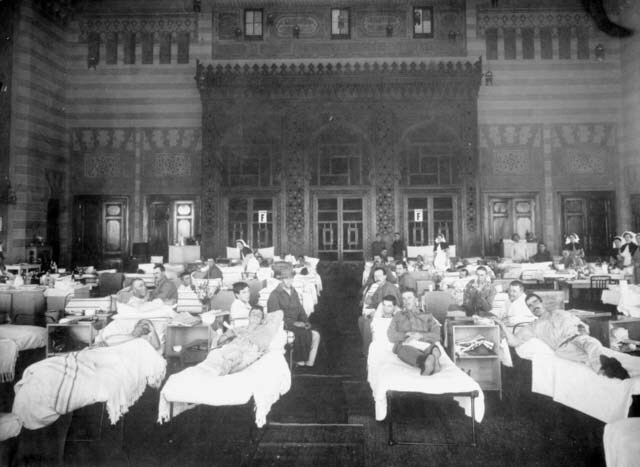 Some of the patients in the grand dining hall, possibly Australians who had taken part in the fighting at Gallipoli. 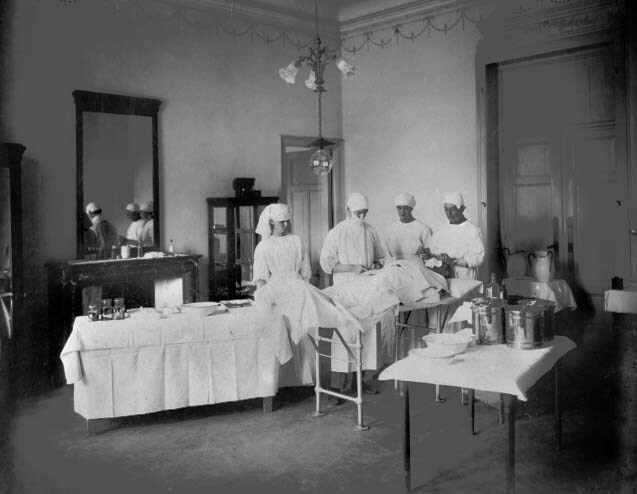 A room at the hotel converted into an operating theatre. 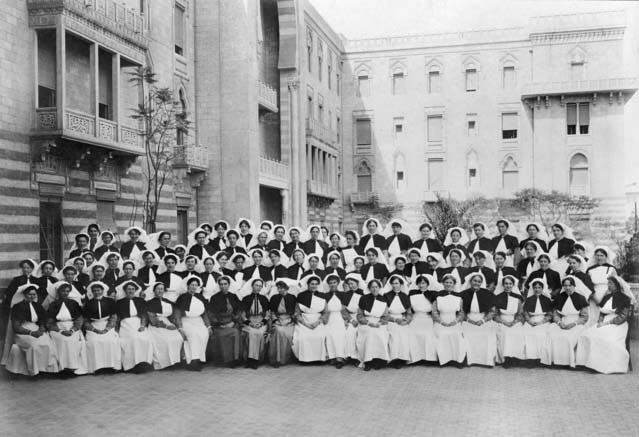 Australian nurses arrayed for a photo op at the rear of the hotel/hospital. 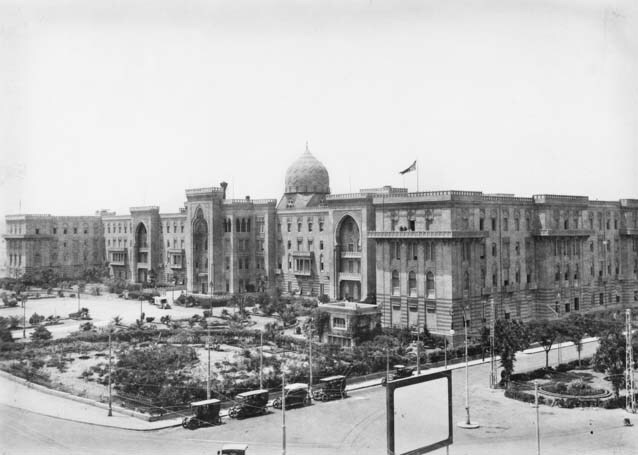 Parked ambulances with the Heliopolis Company offices on Ibrahim al-Laqqani Street in the background. 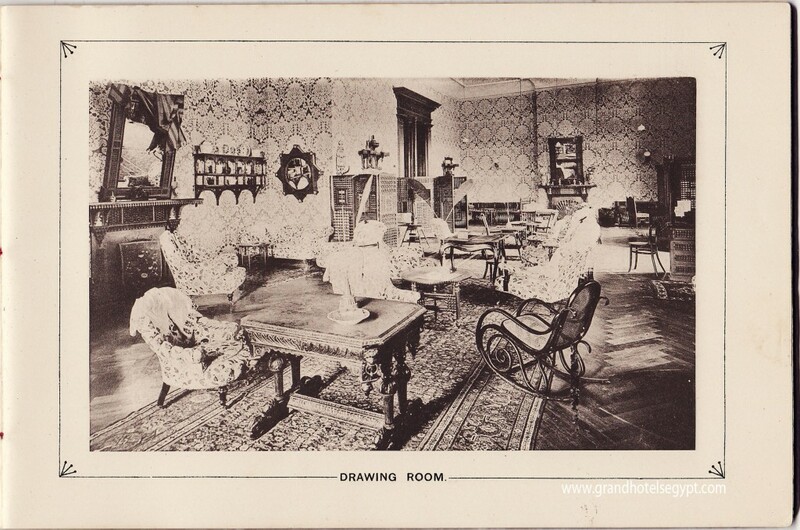 A pingback linking to this site alerted me to a fascinating post over at the Sydney Living Museums website. 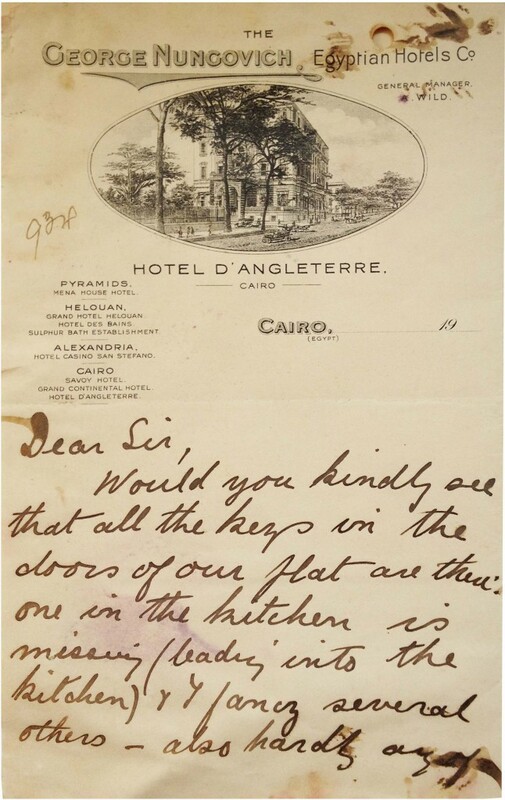 It concerns a new book containing correspondence between Dora Sheller and her son Leslie Walford, one of the leading figures in Australian interior design until his death in 2012. 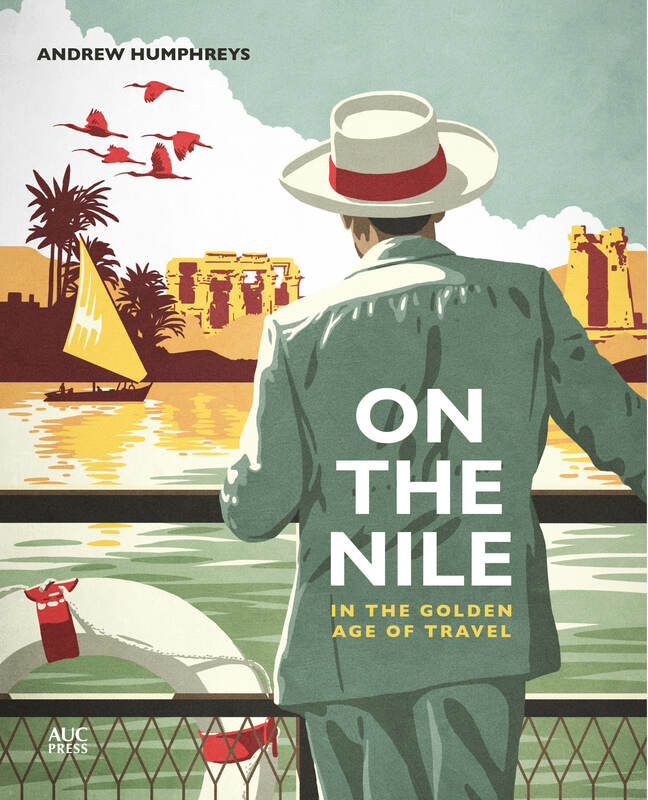 In 1929 Dora Walford, a glamorous Sydney socialite, set off on a honeymoon voyage to England, stopping off in Cairo from late December 1929 until the first week of January 1930. 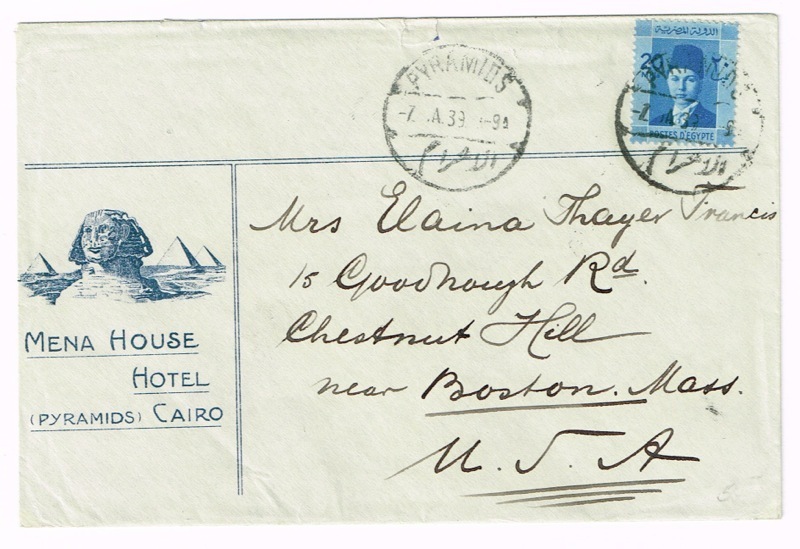 She was well-heeled enough to stay at the top hotels, notably Mena House and Shepheard’s. 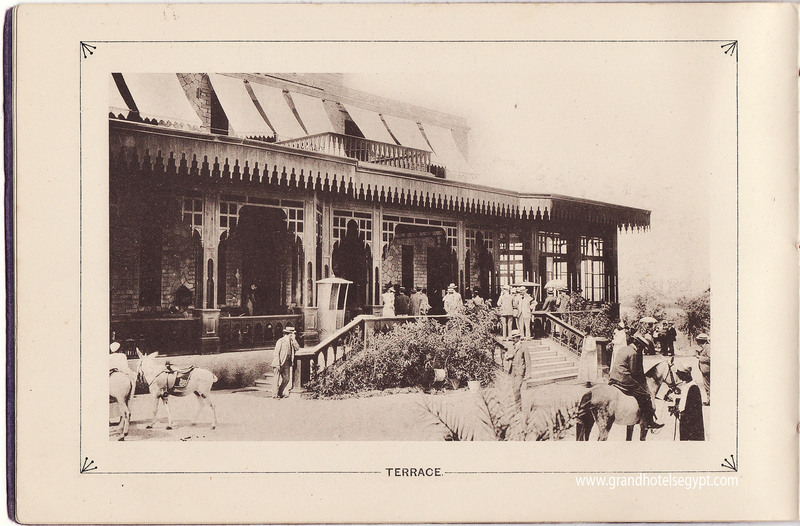 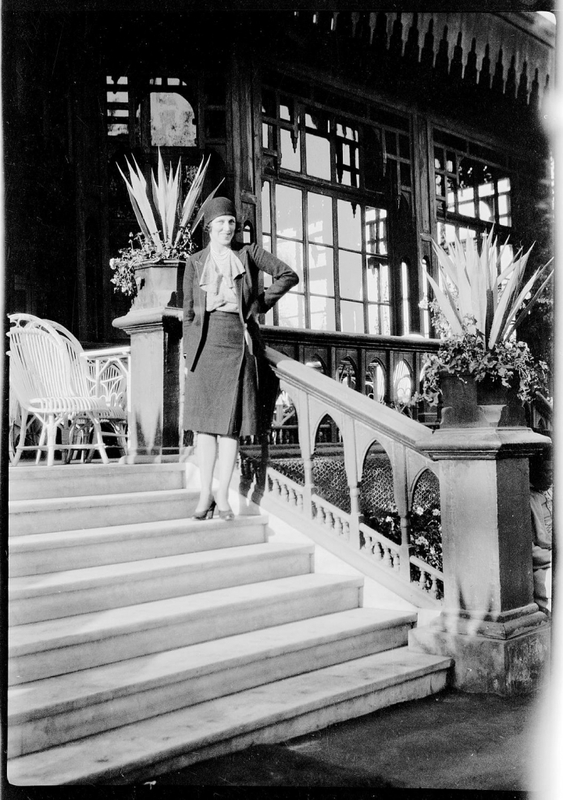 The photo below is Dora on the steps to the tea gardens at Mena House. 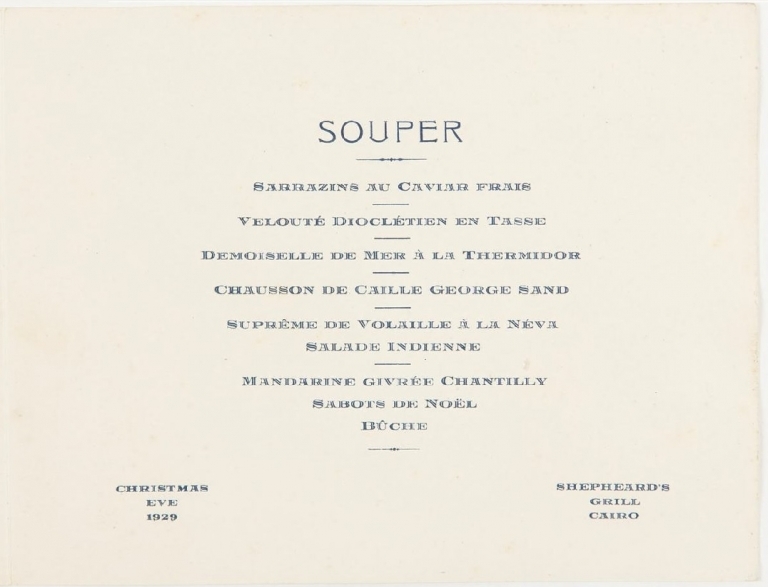 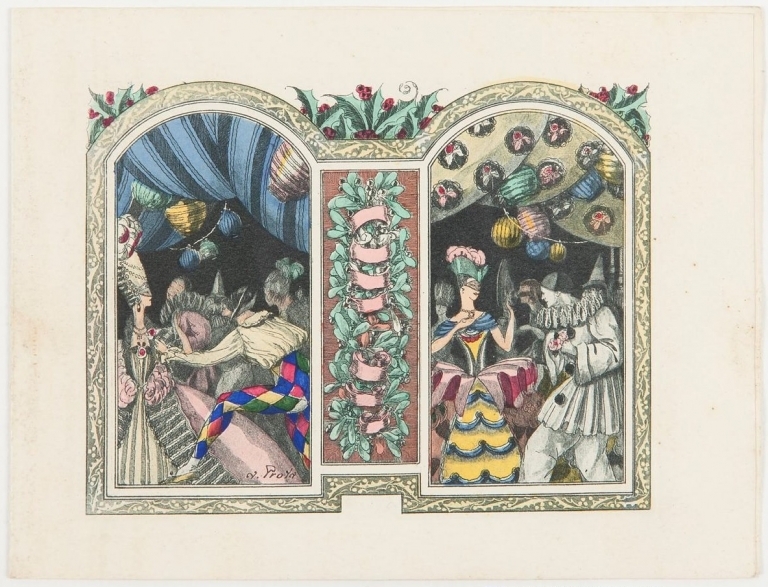 Dora spent Christmas at Shepheard’s and kept hold of the printed and tassel-corded menu for the Christmas Eve dinner at Shepheard’s Grill, with a beautiful cover showing a masqued ball in full swing. 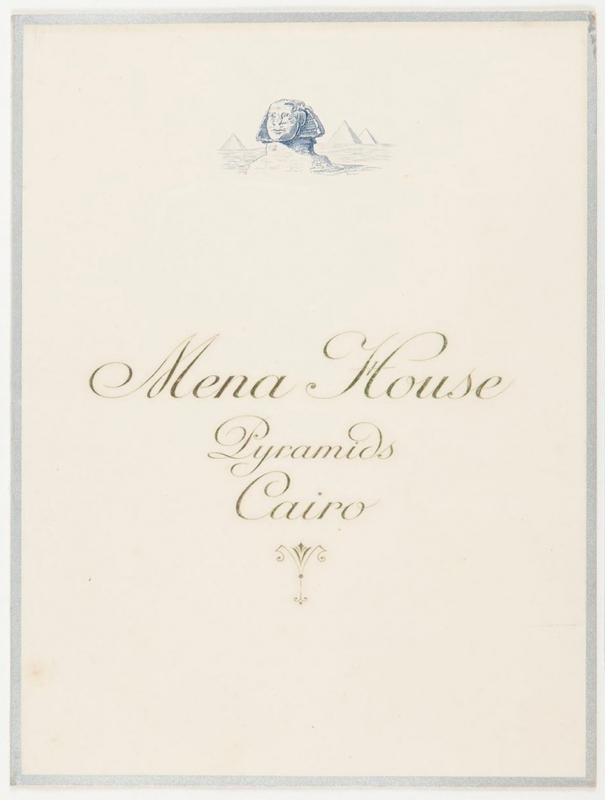 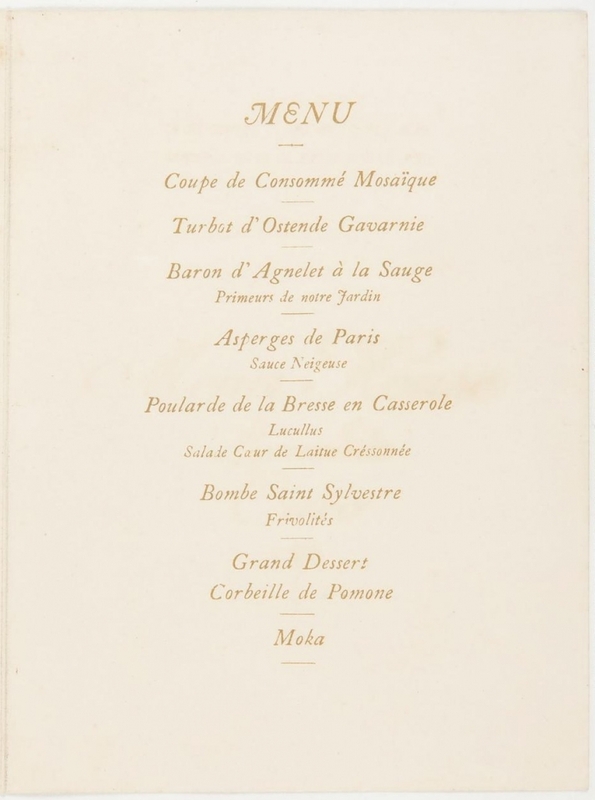 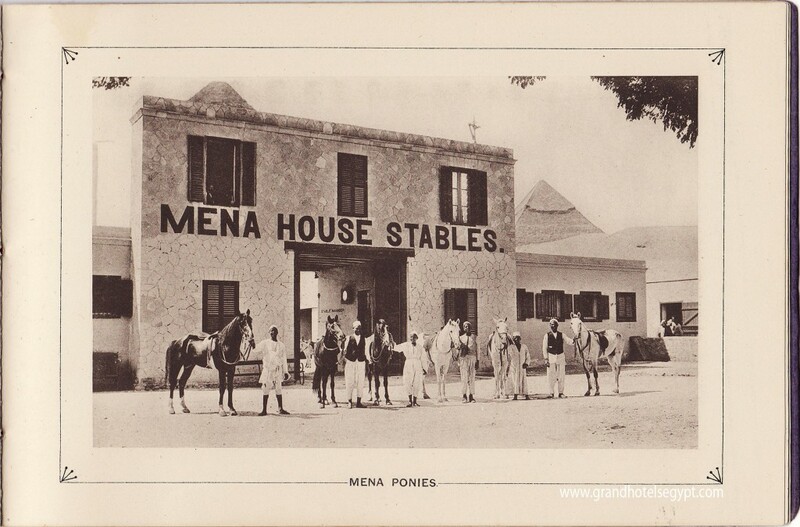 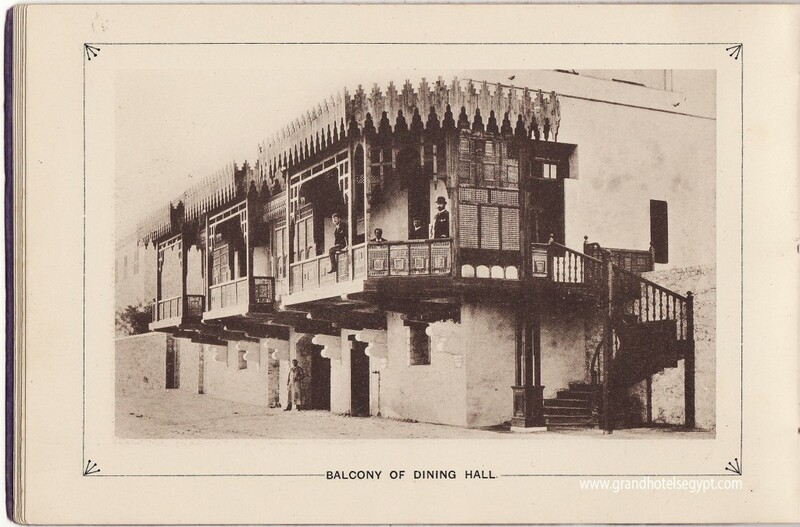 A few days later Dora dined at the Mena House and, again, she kept the menu. 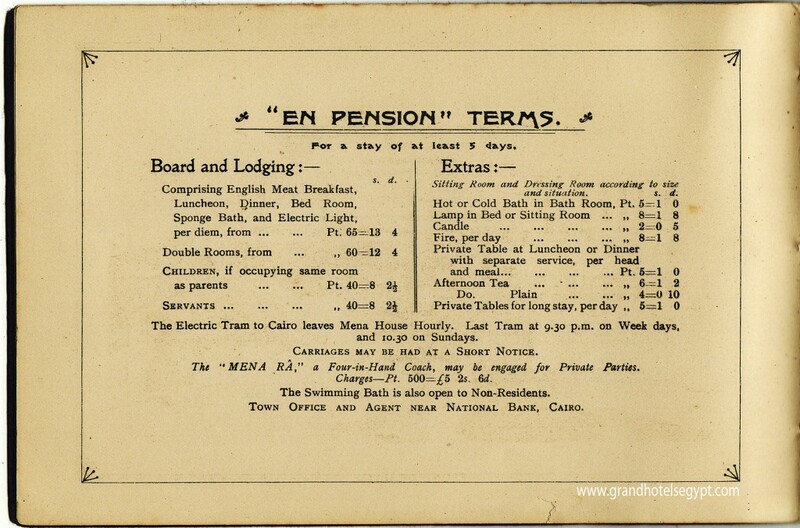 After getting through all that, you’d imagine Dora wouldn’t have to eat again until she reached England. 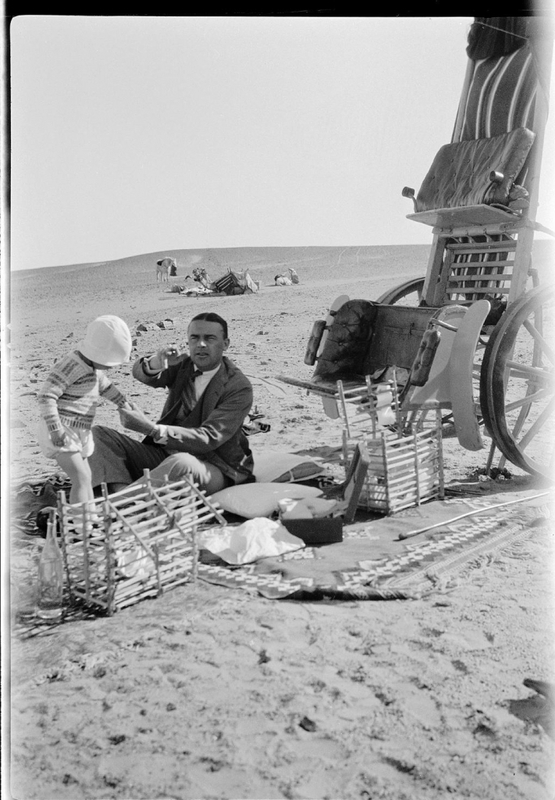 However there was a trip into the desert – which may have just been across the road to the Pyramids – for which the Mena House provided a picnic that was transported on its own trolley, as seen in the photograph below, which shows Dora’s husband Eric Sheller and son Leslie. All these items come from the Caroline Simpson Library & Research Collection, Sydney Living Museums. 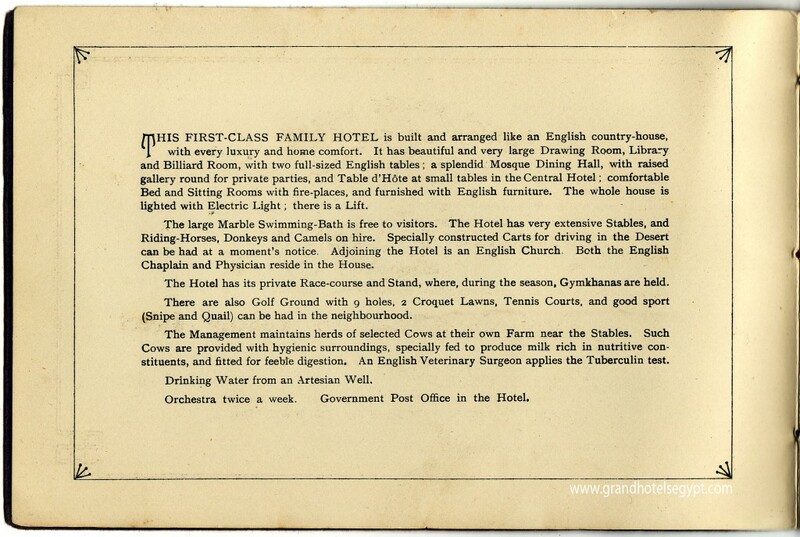 You can read more here. 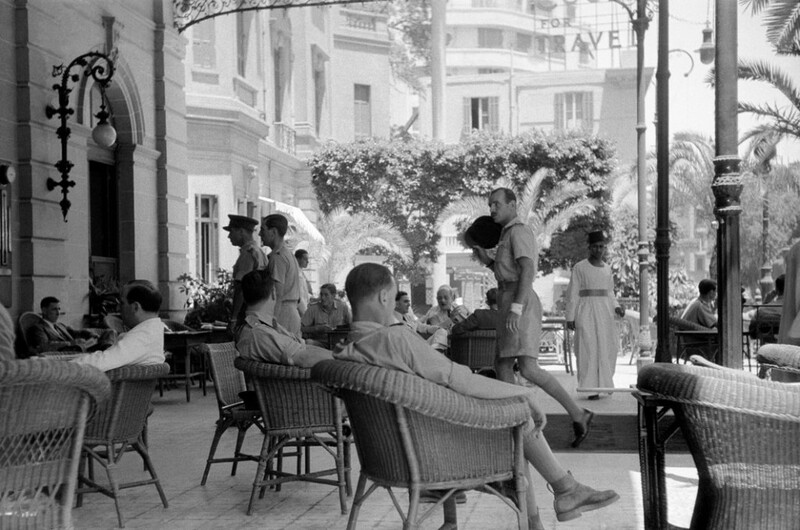 Not too much to say about the photo above except it depicts British officers (no non-ranked soldiers allowed) relaxing on the terrace at Shepheard’s in 1941 and it’s new to me. 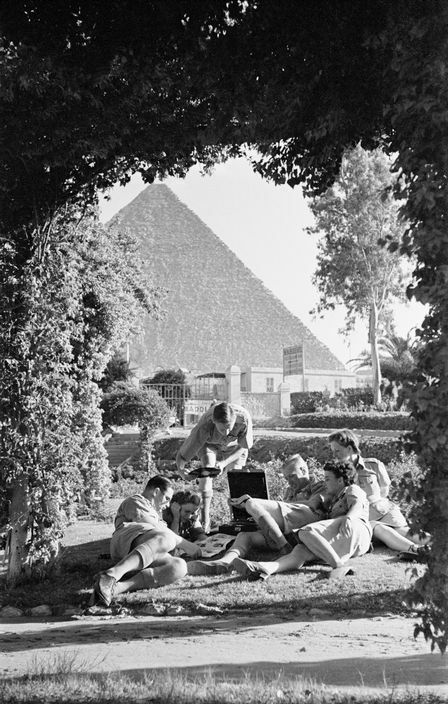 It was shot by British photojournalist George Rodger (1908–1995), who went on to photograph the mass graves at the Bergen-Belsen concentration camp at the end of World War II and later became famous for his images of tribal Africa. 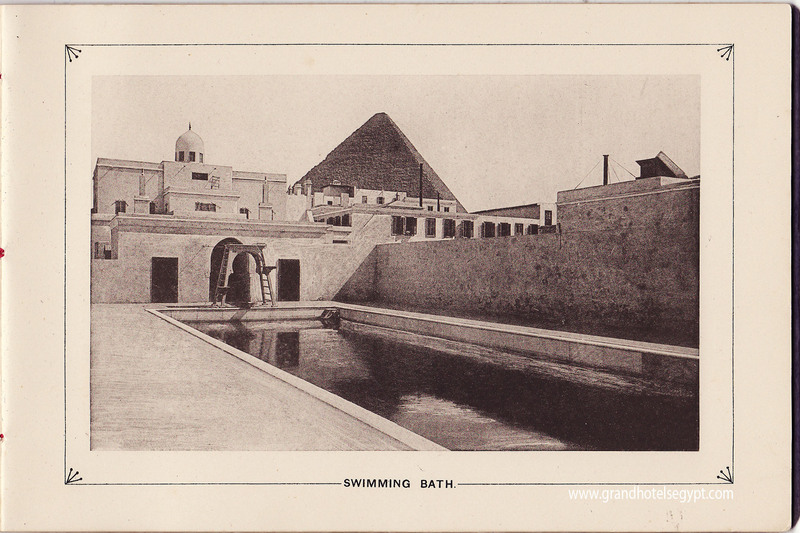 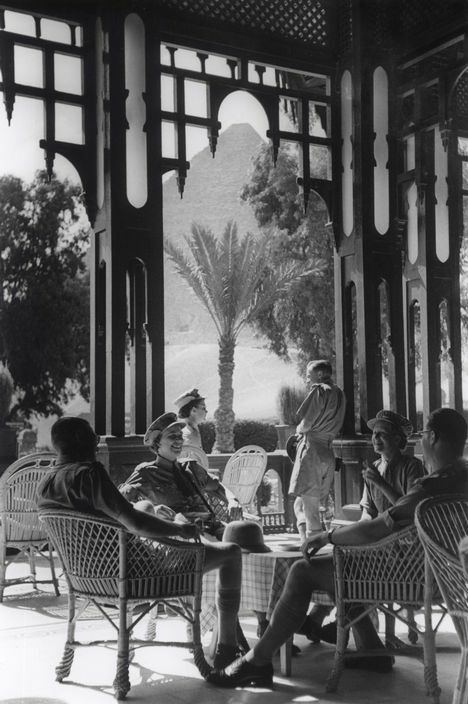 Rodger also shot the images below of soldiers relaxing at the other grand Cairo hotel, the Mena House. 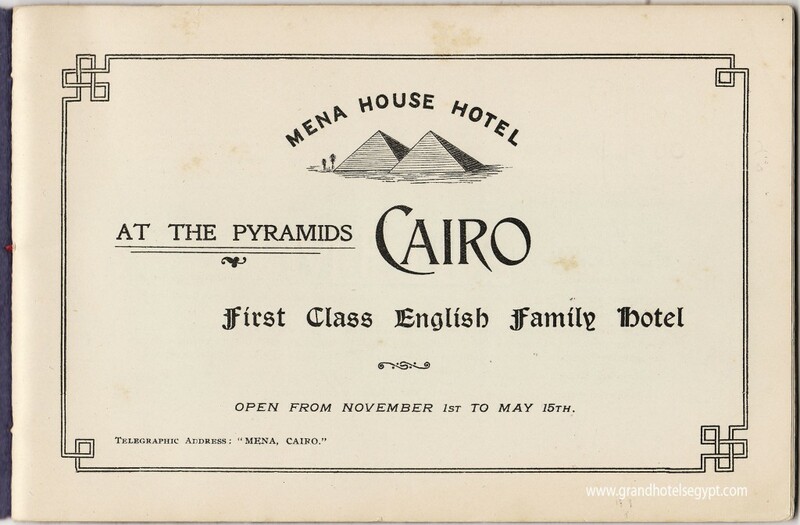 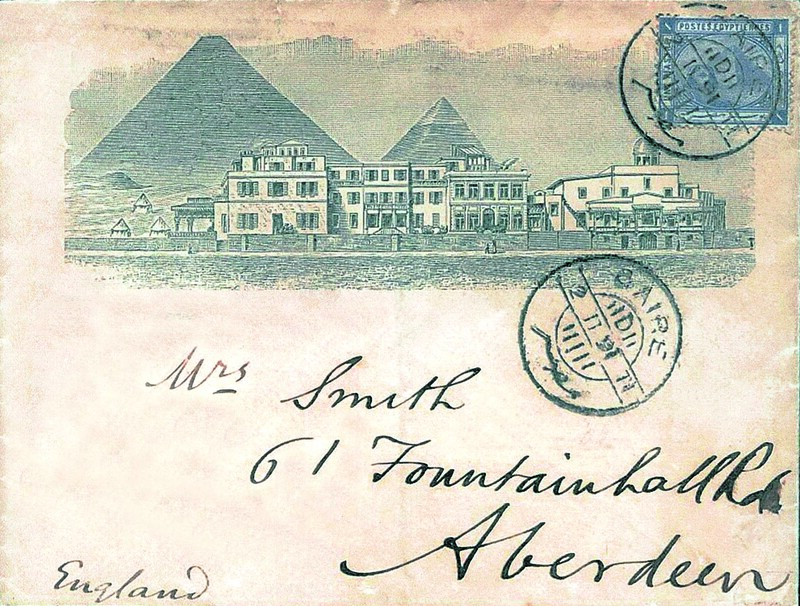 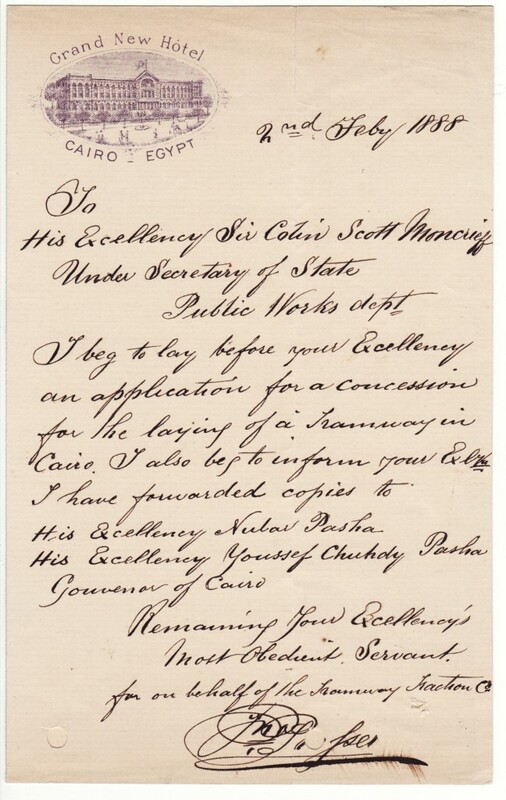 The same printers that provided Egypt’s hotels with their fabulous posters and luggage labels, also designed some terrific letterheads and decorated envelopes (click and click again to enlarge). 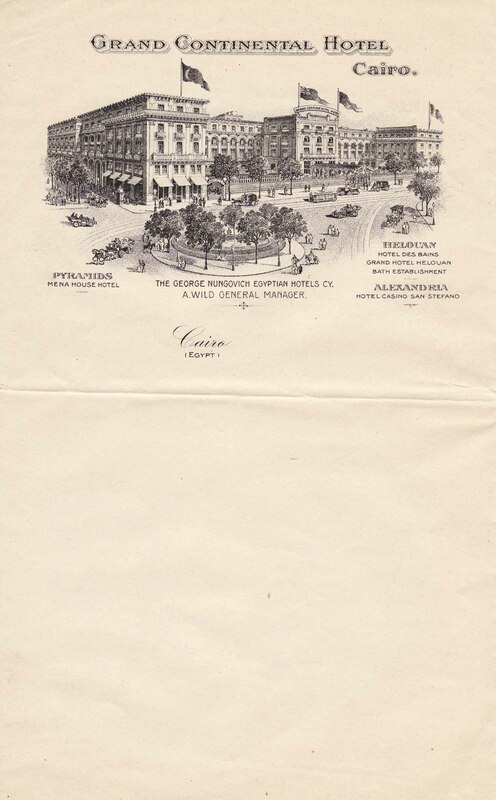 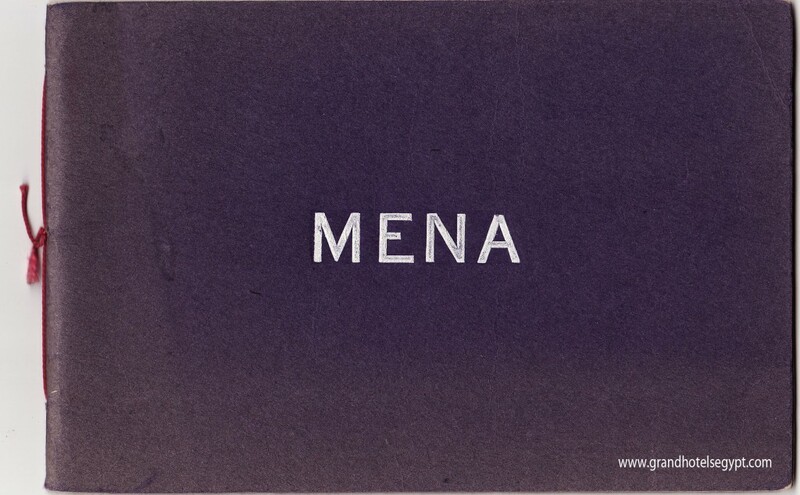 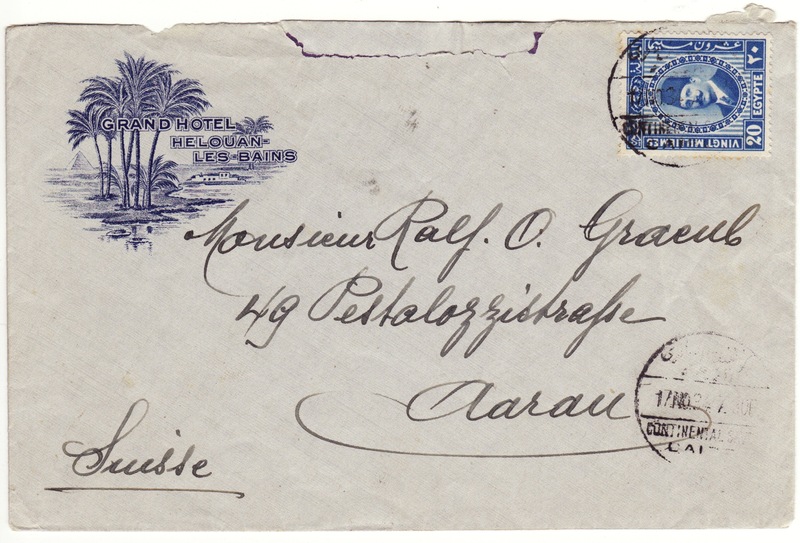 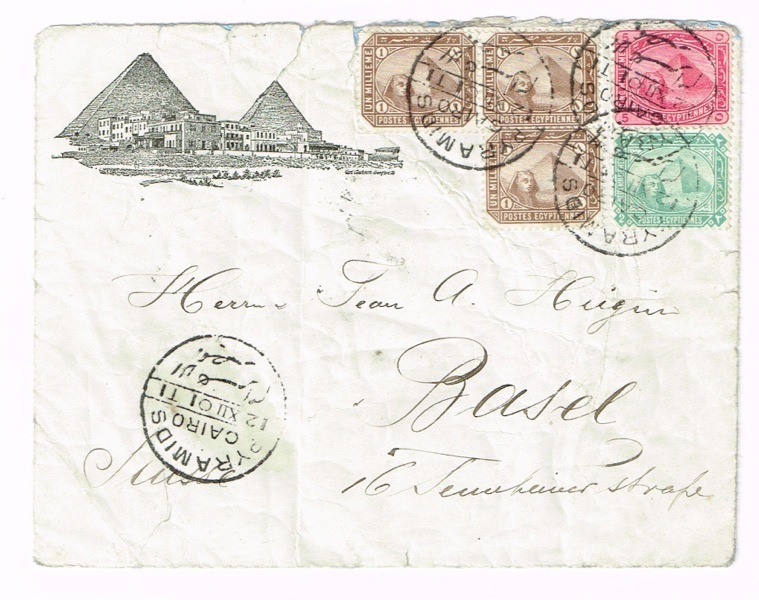 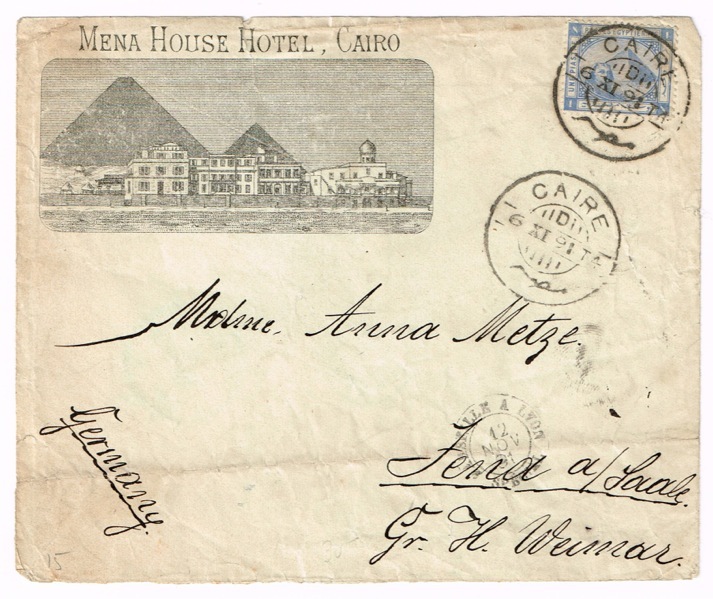 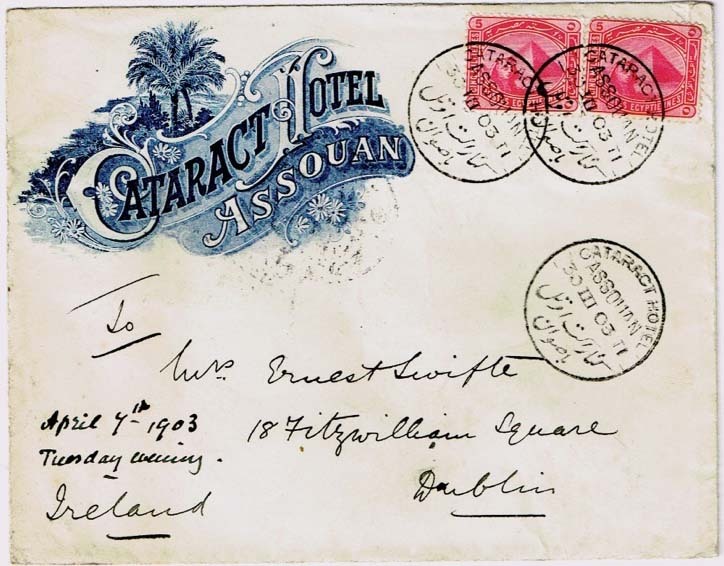 A bunch of envelopes posted from the Mena House: the first is from 1891, just five years after the hotel opened, the second from 1894, then two from 1901 and the last is from 1939. Back in the ’30s if a company marketing booze in the US wanted to imbue its product with a bit of glamour and sophistication then one way to do it was to suggest the drink was just the sort of thing being downed on the terraces of the hotels of Cairo. 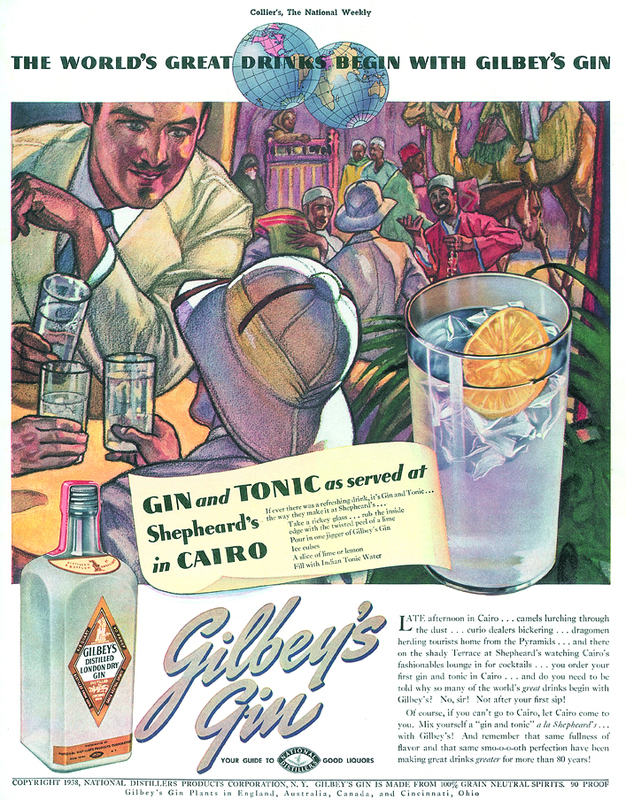 In the magazine ads below Hennessy cognac and Gilbey’s gin grace the tables at Shepheard’s, while Canadian Club is favoured at the Mena House. 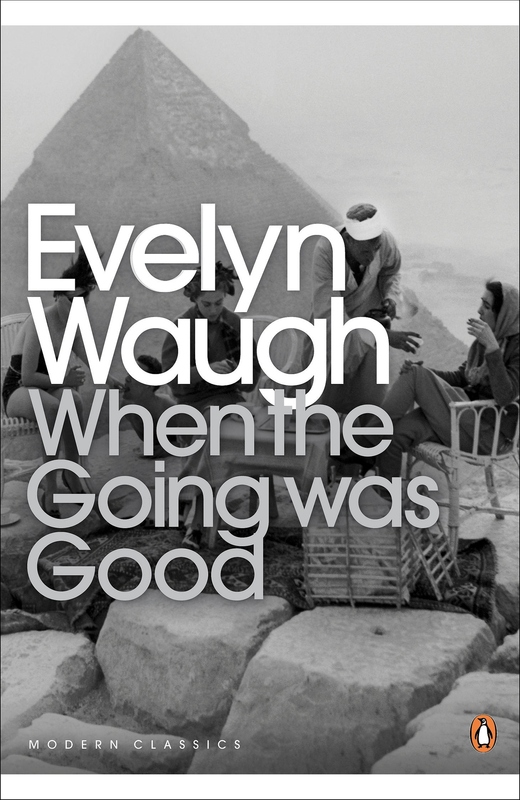 The cover was chosen because it’s a striking and appropriate image. 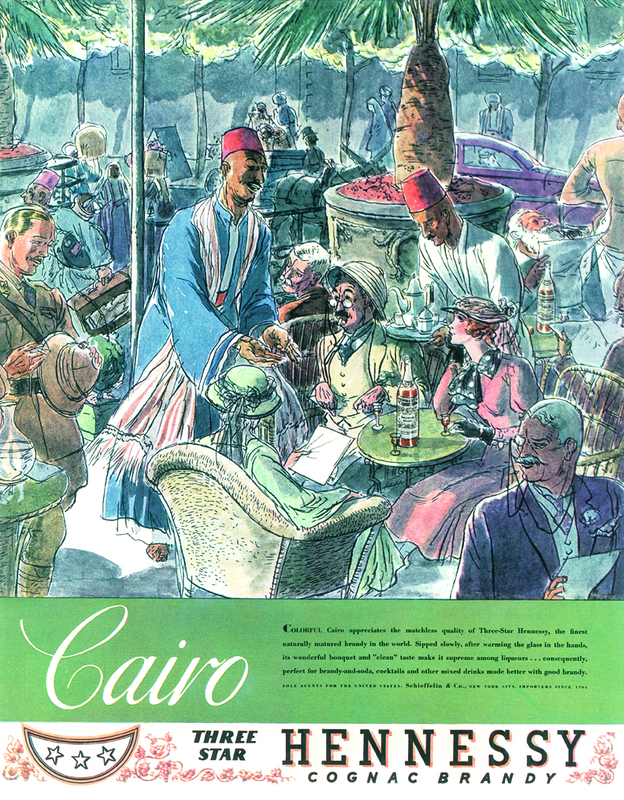 It’s a genuine poster from the 1930s and the scene is of the terrace at the Mena House, one of the hotels covered at length in the book. 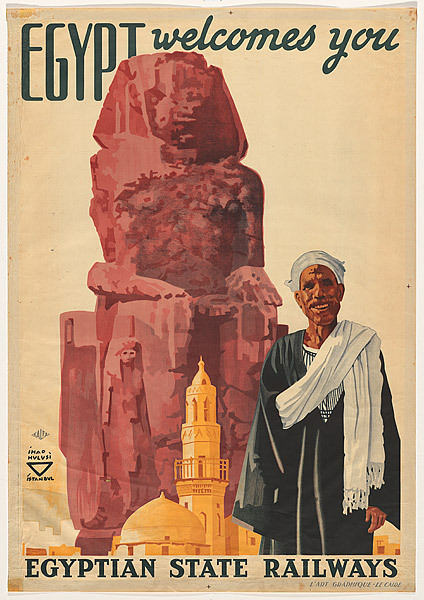 The original poster (above) was designed by the graphic artist Ihap Hulusi Gorey. 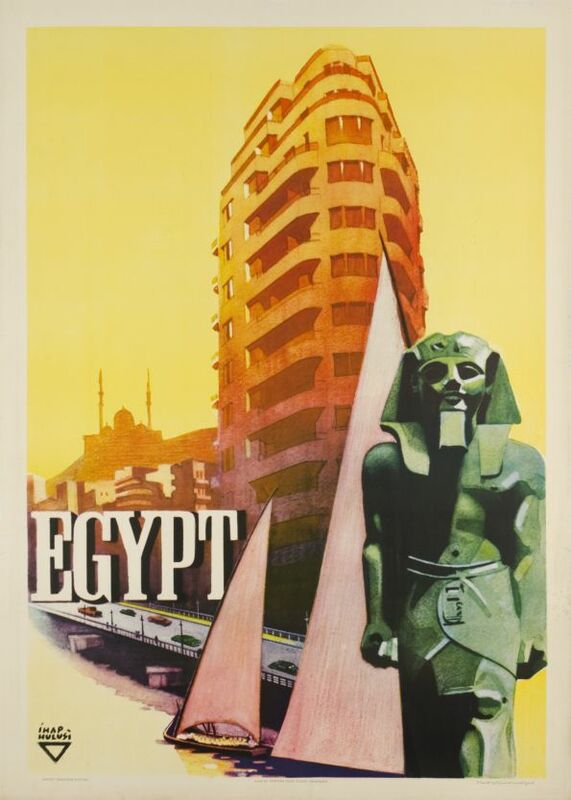 Born in Cairo in 1898 to a Turkish family, Hulusi left Egypt to study art in Munich before setting up his own studio in Istanbul in the latter half of the 1920s. 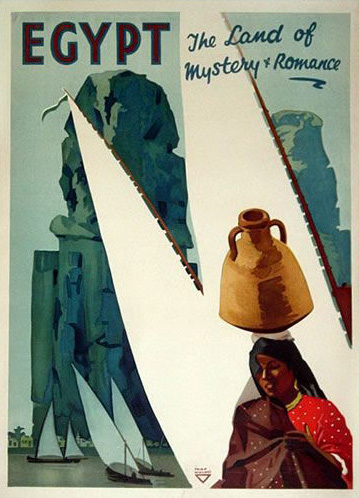 He was one of the first graphic designers of modern Turkey and a fervent supporter of nationalist leader Kemal Atatürk. 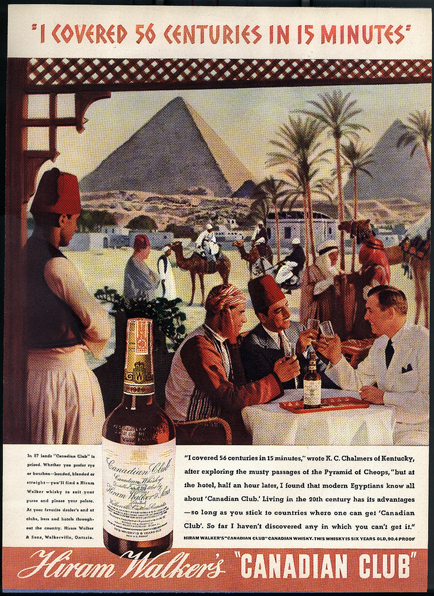 He was hugely influential, initially producing endless propaganda and educational posters for the new republic, later doing a lot of work for major international brands such as Cinzano, Haig whisky and Fernet Branca. 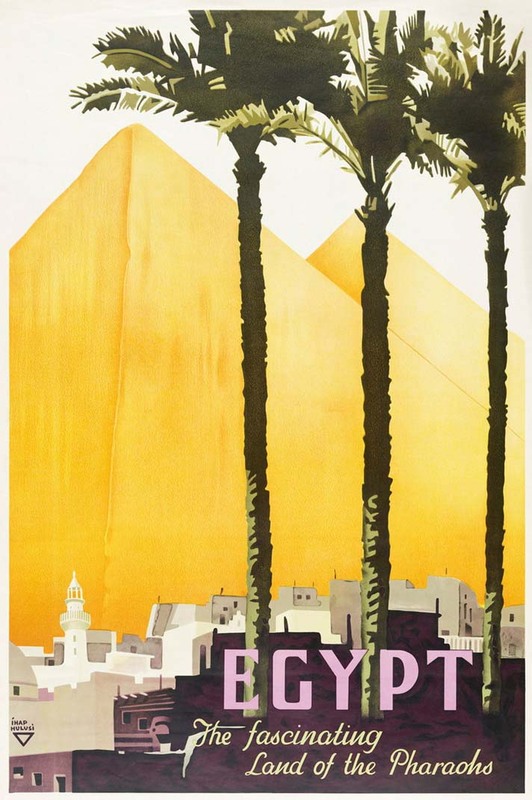 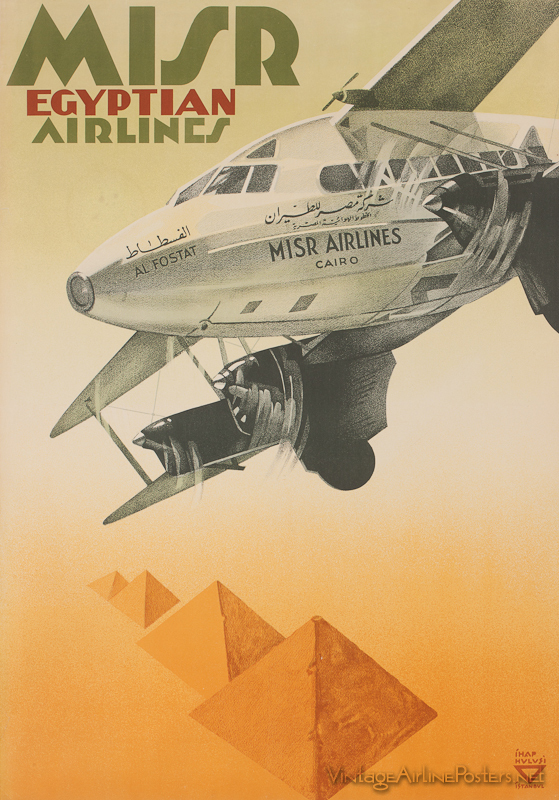 At some point he was also commissioned to produce a series of posters for the Egyptian government and Misr Air, some of which are below. 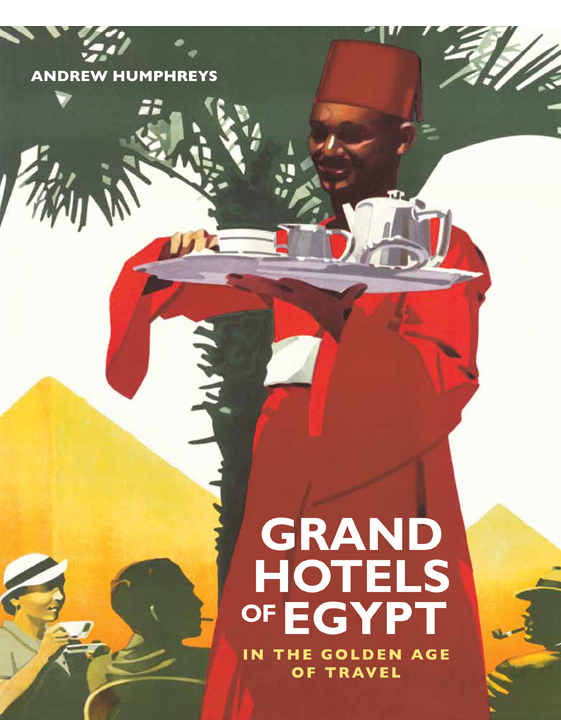 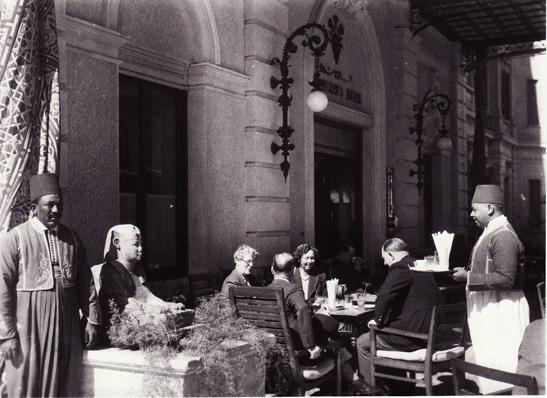 The poster we used for the cover of my book is an artfully executed portrayal of the hotel life of the time: the dignified sufragi in uniform bearing tea things on a silver tray past a table of pale-skinned foreigners enjoying afternoon refreshments. A bit of a cliché perhaps, but beautifully done and very evocative of the era covered by the book. 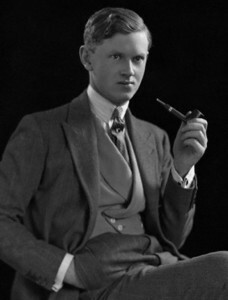 Ironically, the Thirties graphic style aside, the thing that really dates the image is the clothing and accessories of the Westerners – the pipe, trilby and ladies’ suit hat. 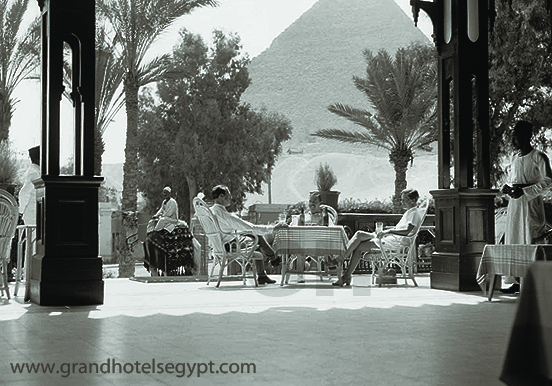 The fancy garb worn by the waiter – or a variant of – is still uniform in plenty of upmarket hotels in Egypt today, where serving staff are still often Upper Egyptians starting careers on the lower rungs of the ladder. 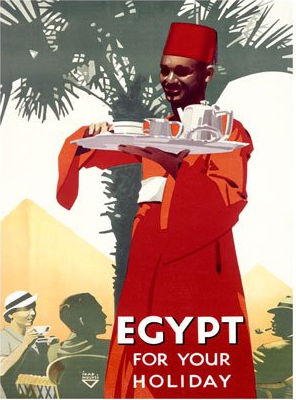 Is this racism? I don’t think so, I think most people would just recognise it as tourism.